17. 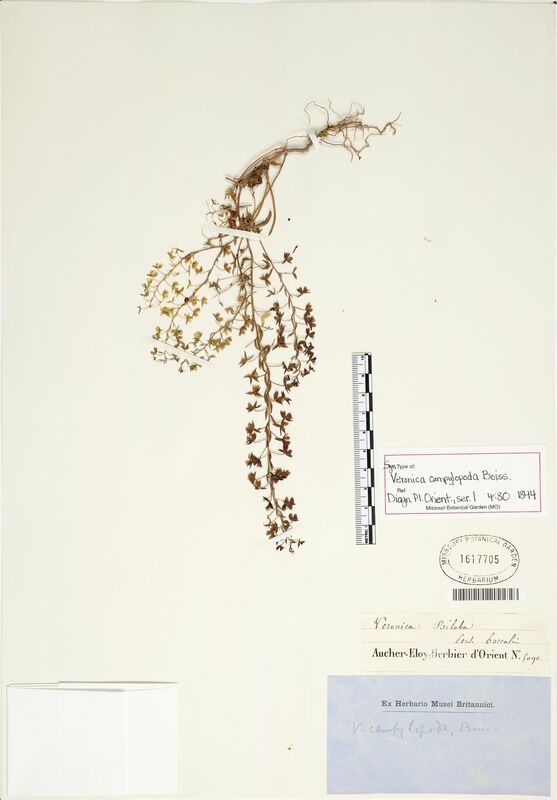 Veronica campylopoda Boissier, Diagn. Pl. Orient., ser. 1. 1(4): 80. 1844. Annuals 5-15(-30) cm tall. Stems erect, slender, simple or branched below middle, curly hairy. Lower leaves short petiolate; leaf blade oblong to lanceolate, 4-12 X 2-5 mm, sparsely hairy, margin entire or dentate. 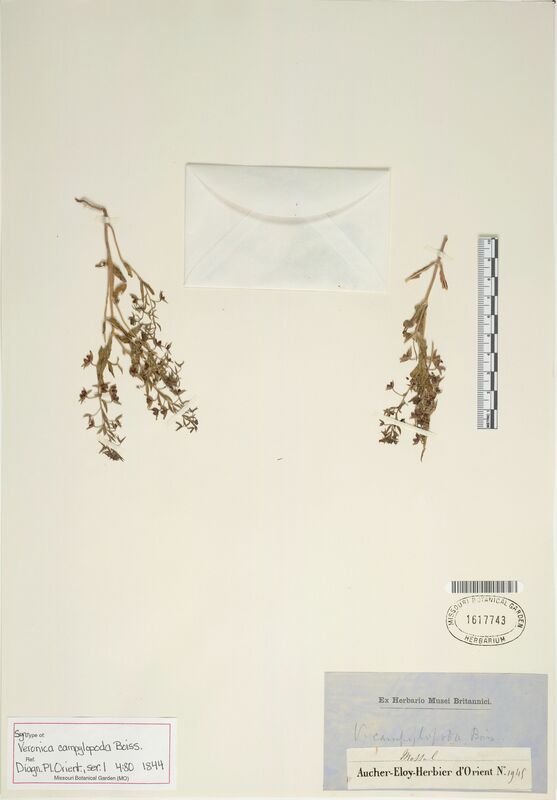 Racemes terminal, sometimes also axillary, lax, to 10 cm, axis and pedicels with white curly hairs to 0.2 mm mixed with glandular hairs; bracts alternate, narrowly lanceolate, smaller than leaves, margin entire or rarely dentate, apex acute. Pedicel filiform, 4-6(-10) mm in fruit, usually longer and to 2 X as long as bract, usually distinctly recurved in fruit. Calyx 4-lobed, laterally not parted to base; lobes lanceolate, ca. 3-5(-6) X 1-1.6 mm, sparsely with eglandular and glandular hairs, hairs 0.1-0.3 mm, apex short acuminate. Corolla blue to pale blue, rotate, 2-4 mm in diam. Capsule nearly as long as to slightly shorter than calyx, strongly compressed, 3-4 X 3.5-4.5(-6) mm or smaller, notched almost to base; lobes obovate, notch angle 45-60(-75). Style (0.5-)0.8-1.2(-1.4) mm, to middle of notch. Seeds 6-14 per capsule, navicular, narrowly ovoid, ca. (1-)1.3-1.7(-2) X 0.6-0.8(-1.1) mm; seed coat transversely 4-6-folded. Fr. Jun. 2n = 42. Waste fields, dry slopes. Xinjiang, W Xizang [Afghanistan, India, Kashmir, Kazakhstan, Kyrgyzstan, Pakistan, Russia, Tajikistan, Turkmenistan, Uzbekistan; SW Asia].